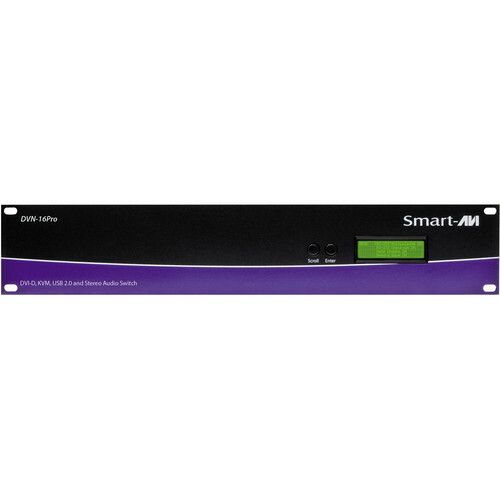 The Smart-AVI DVNET-16PRO-S DVI-D KVM Switch lets you access and control up to 16 computers using only one USB keyboard and mouse and a DVI-D monitor. It is a dedicated multiplatform DVI-D KVM switch capable of managing up to 16 different computers through a single KVM configuration. The USB emulation technology utilized by DVN-16Pro enables immediate hotkey source switching through a remote USB keyboard and mouse. This switch uses single link connectors providing high resolutions of up to 1920 x 1200 with 0 pixel loss from TMDS signal correction. The Switch provides a simplified management approach for up to 16 computers with DVI-D, audio, and USB 2.0 outputs. This dynamic KVM console can be controlled remotely from easily accessible keyboard hotkeys or RS232 commands as well as directly through the console’s easy-to-read front panel. Detection of DDC signals for all attached devices is effortless due to its real EDID learning and programming. This is vital in optimizing the resolution of the selected graphics card to properly display on the remote monitor. Furthermore, the EDID learning feature continues to replicate the right DDC for the computer to enable the display card to effectively work when unused ports are not selected. The USB keyboard and mouse emulation utilized in this switch provides an accurate and quick source switching by means of keyboard hotkeys and mouse actions. It imitates the presence of a keyboard and mouse for every attached computer through a USB cable. This is essential as it simulates the existence of the keyboard and mouse to all the computers while switching without interruptions. Flexibility is key to the DVN-16PRO Switch. It enables the use of a USB keyboard and mouse of one computer while other USB peripherals such as speakers, scanners, and printers are connected to other computer sources. It maintains the ability to switch all connected devices to any one of the computer sources as with any other KVM switches. This KVM Switch has a broad range of applications, but the main function is to centralize the access of several computers into one comprehensive PC. Not only does it function as a KVM console, it also supports USB 2.0 functionality. This allows a user at the console to use USB device such as a flash memory drive or camera without having to plug it directly into the remote computer. This switch is a suitable solution for the medical or industrial field for instance, where it may not be practical (or safe) to have one or more CPUs in the general vicinity. It can also be used in server collocation, digital signage, education, airports, dealer rooms, control rooms, audio/visual presentations, shopping centers, hotels, and resorts. RS-232: Any external device or program supporting RS-232 can control the DVN-16PRO. It uses a very simple protocol that enables easy integration with other devices. IR: Infrared remote control enables integration and control of the KVM switch. TCP/IP: SMTCP-2 is a Smart-AVI TCP/IP converter that enables users to switch and control the DVN-16PRO control from anywhere in the world using a LAN or WAN connection (sold separately). EDID utility: Detection of DDC signals for all attached devices is effortless with DVN-16PRO due to its real EDID learning and programming. This is vital in optimizing the resolution of the selected graphics card to properly display on the remote monitor. Furthermore, the EDID learning feature continues to replicate the right DDC for the computer to enable the display card to effectively work when unused ports are not selected. Box Dimensions (LxWxH) 24.0 x 18.0 x 13.0"